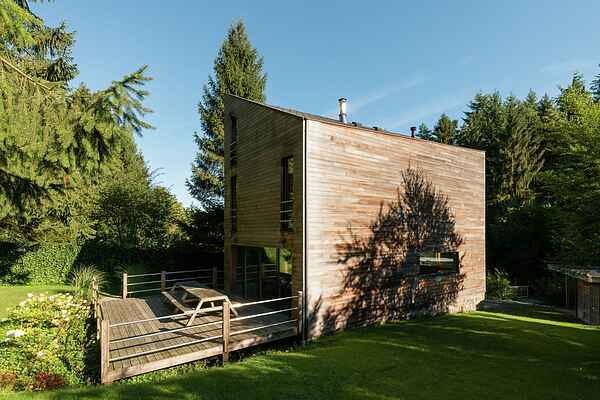 This modern \"energy efficient\" holiday home is situated in a quiet leafy area, 6 kilometers from the center of the smallest town in the world: Durbuy. The atmospheric holiday home immediately reminds you of that special holiday feeling. The holiday home has been decorated in a modern fashion and has all modern conveniences. Some of the walls have bright, fresh colors. On cooler days you can spend the evenings by the fire place. In the summer you can enjoy the lovely barbecue on the terrace. The children will enjoy themselves on the playground equipment in the open garden. This holiday home is aimed at families. For your daily shopping you can go to Barvaux-sur-Ourthe (3 km), where you'll also find banks and even a cinema. The River Ourthe flows from Barvaux to Durbuy; the best place in the Ardennes to go kayaking. From your holiday home you'll enjoy a walk or a bike trip to Durbuy. Spoil yourself in one of the many romantic restaurants and enjoy the charm of this small, authentic village. Lovers of the game of golf will definitely appreciate the 18 hole course in Barvaux-sur-Ourthe, 6 kilometers away, located in a wooded and hilly landscape. Ski and cross country ski pistes are 23 kilometers away.